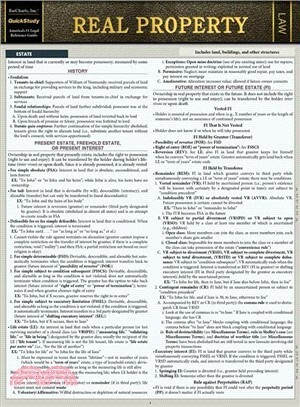 Essential core of real property law in a 6 page laminated guide authored and designed for quick reference. Use as a review for exams, to find a fact fast, for refreshing memory, or to constantly reinforce your knowledge base. With the mass of knowledge and facts needed for a law degree and then for practicing law, a trusted reference source is rarely found at this price that works so well. Lamination ensures the guides will last a lifetime through school and beyond. Law students, lawyers and paralegals have agreed QuickStudy law guides are a must-have.